Today is the third week in a six-week-long series of giveaways we're hosting in conjunction with designer Lesley Grainger. This time, we're excited to be giving away a fat quarter bundle of her Pretty Paisley Flannel! Just leave us a comment below for a chance to win! And remember, Lesley is hosting an identical giveaway on her blog, so you will double your odds of winning if you leave a comment on both blogs. A randomly selected winner will be announced on Monday as usual. 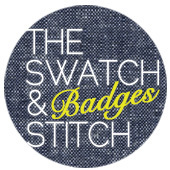 Good luck to you all and thanks for stopping by the Swatch & Stitch!